Made with organic spices and developed at David Rio Chai Bar's Chai Lab on Market Street in San Francisco! This soothing and healthful organic blend combines turmeric with cinnamon, cardamom, ginger, black pepper, and cayenne pepper. Turmeric has been used in India as a spice and is known for its many anti-inflammatory benefits and strong antioxidant properties. This distinctively different taste profile can be consumed on its own, but it also pairs exceptionally well with chai.�Vegan, gluten free, non-GMO.�Easy resealable bag.�Makes�170 servings. Also available in a 2.8oz canister. While this warm, comforting beverage seems like a new drink, the turmeric latte actually has a long, rich tradition. 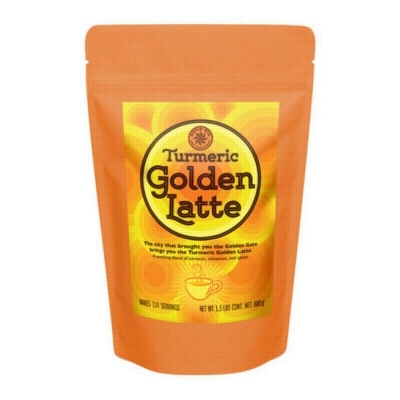 Within Ayurveda, Turmeric Latte is a tonic that�s meant to be nourishing, while also tasting delicious. With just one sip, you�ll understand. Just as in the West, warm milk has been used as a comforting bedtime beverage, �turmeric tea� has served the same purpose. David Rio�s use of organic spices and balanced combination of turmeric offer a unique taste profile and additional benefits. Because there is no caffeine in turmeric, you can enjoy a Turmeric Latte any time of day. For each 6 ounce serving: Add 1 teaspoon David Rio Turmeric Latte spice blend to a serving cup. Steam 6 ounces of milk, almond or soy; add 2�3 ounces of hot milk to cup and mix well. Top off with remainder of milk to create latte art. INGREDIENTS: Organic spice blend (turmeric, cinnamon, cardamom, ginger, black pepper, cayenne pepper) and organic cane sugar.